This palette has a flat and reliable surface that will not bow. 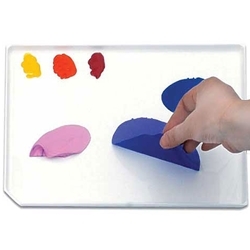 Acrylic colors peel off and oil colors wipe off clean. It has an unobstructed 12.75" x 8.875" surface with a slight lip to prevent paint from migrating off the edges.